"A Man Feeding Swans in the Snow"
" I made this shot of Grunwaldzki Bridge in Krakow. 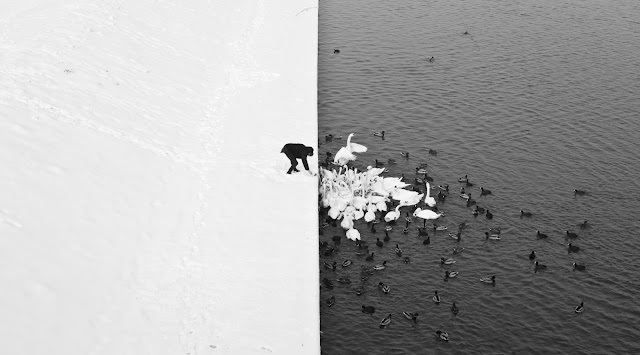 Firstly I saw an unusual contrast painted over nature - white snow and the black of the Vistula River, cut off from each other by equal line of water. This scene reminded me of a yin-yang symbol and that was the initial concept for this image. Through the nature - on a black background appeared white swans and black background white figure, I photographed the moment, admiring by this extremely simple and reflective scene. "